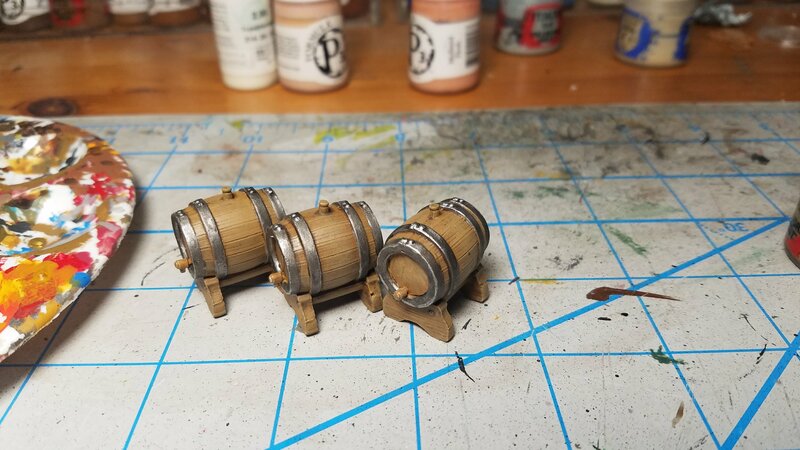 Finished a quick paint job on 3 keg barrels from the Pathfinder Deep Cuts collection. Painted up easy, they come pre-primered with Vallejo primer. Not 100% sold on their primer job but it was adequate. Looking forward to other items from the line. Was looking for some area terrain templates for foliage/trees I wouldn’t have to build myself. I know that sounds lazy, but time’s not a big luxury for me these days. Was fortunate to be directed to Worldsmith Industries, and their area terrain templates. I received the order this week and thought I’d post what they looked like out of the box. Looking forward to cleaning and painting these up along with adding plants and trees. I ordered the Base 3, Base 4, and Base 5.2 pieces along with 6 Bare Earth and 6 Tree Stump inserts. Here’s the three of them together, with the 50mm inserts spread across the group. As you can see, the casting is clean, few details needing cleanup/edges trimmed. The stumps fit the palms I picked up on Ebay nicely, and I can use the flat inserts for other trees I have with thicker trunks and/or clumps of plants. The resin is sturdy, but not too thick. Plenty of table coverage with these guys. One other thought. The 50mm inserts are pretty stable alone. The blanks are great for 50mm foliage clumps, and the stumps for trees. Topheavy terrain may not do as well, but it’s a thought. Could always buy an assortment of both (the inserts are sold in packs separately so you can mix and match) to have on hand for the templates or as standalone scatter. I did ask Worldsmith if they would be creating these without the rock formations sculpted in. At this time they have no plans to, but additional flocking/plants glued down will cover up the ones I don’t want showing easily. Look for progress reports coming (hopefully) soon. Overall, definitely worth the price! Take a look here!